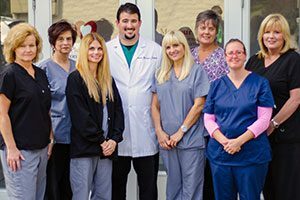 At Montour Dental, we are committed to providing the state of the art when it comes to tooth replacement. Dental implants are a revolutionary new restoration that replicates the anatomy of a tooth, from the root all the way to the crown. Dental Implants look and feel like natural teeth. Patients are able to brush and floss around the implants just like natural teeth, and can eat normally. Many of our implant patients say that their implants feel so natural that they forget they have them! An advantage of dental implants is that they can be placed without impacting the teeth adjacent to the space. Another benefit of implants is that they are a very long lasting restoration. Having an implant placed is a simple process. Dr. Bernard or a specialist will numb the patient and place the implant body in the jaw during a short procedure. After the implant heals in the bone, Dr Bernard will make a crown on top of the implant to replace the missing tooth. Please contact our office for more information.